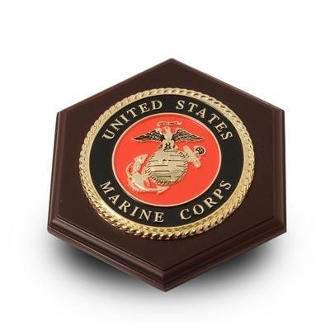 U.S. Marine Corps Medallion Paperweight is an elegant desktop accessory. The paperweight is made from Mahogany colored wood, in the shape of a six-sided hexagon. The outside dimensions measure 6-Inches by 7-Inches by 1-Inch. The U.S. Marine Corps Medallion is centered in the middle of the paperweight. The bottom is lined with felt.